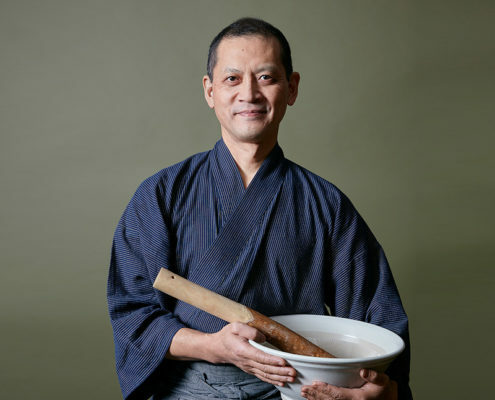 Toshio Tanahashi is a master of shojin-ryori cooking, an entirely vegetarian Buddhist cuisine. He trained in Shiga prefecture at Gesshinji, a Buddhist temple with a tradition in shojin cooking, before going onto open Gesshinkyo, a highly acclaimed restaurant in Tokyo. In 2008, Toshio established Zecoow Culinary Institute and taught ‘culinary arts and design (Shokugei)’ at Kyoto University of Art and Design. He has given lectures and demonstrations at the Victoria and Albert Museum in London and the Japan Society in New York and Boston, and has been featured in The New York Times, The Financial Times, and the Telegraph Magazine. His books include Shojin: Wonder of Vegetables (Bunka Publishing Bureau) and The Power of the Vegetable, the Time for Shojin is Now (Kawade Shobo Shinsha).